Control box specially designed for use in a sewage treatment plant which, placed close to a basin, can be used to drive motorised equipment by sight. Control by sight is possible if the control box is in "local" mode and has been authorised from the control station. 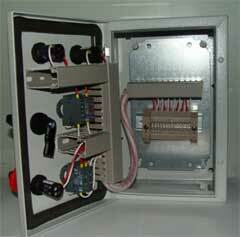 This control box is used to operate equipment by sight. Its function is to control the correct operation of the controlled equipment. offset from the control command part of the power cabinet. Our approach can be customised to your installation or needs, following your prior study.